LAS VEGAS – Oct. 12, 2017 – Barrett-Jackson, in conjunction with The NASCAR Foundation, today announced the charity sale of a 2016 Jeep Wrangler Red Rock Edition at Barrett-Jackson’s 10th Annual Las Vegas Auction, Oct. 19-21, 2017, at the Mandalay Bay Resort and Casino. The vehicle, donated from the personal collection of Mike Helton – NASCAR vice chairman and chairman of The NASCAR Foundation– will benefit The NASCAR Foundation, with 100 percent of the money earmarked to support the UNLV Foundation with funds directed to the UNLV School of Medicine Dept. of Emergency Medicine Residency Program Fund. 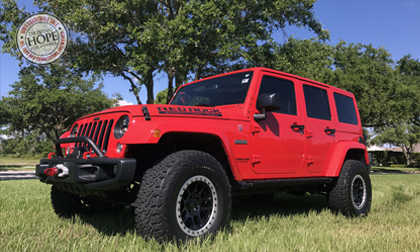 The 2016 Jeep Wrangler Red Rock Edition (Lot #3000) is one of less than 50 production vehicles built by Jeep, and was inspired by Moab and the celebration of the 50th Annual Easter Safari gathering of Jeep enthusiasts from all over the world. The vehicle was carefully delivered to Petty’s Garage and the engine was treated to a supercharger performance upgrade to enhance the power, under the supervision of seven-time NASCAR champion Richard Petty himself. When complete, “The King” put his famous artistic signature on the passenger side portion of the dash. Mike Helton and NASCAR Hall of Famer Rusty Wallace will be onstage as the rare Jeep crosses the block on Thursday, Oct. 19, at approximately 3:30 p.m. The entire hammer price will benefit The NASCAR Foundation, who have chosen to earmark the money for the UNLV Foundation, with funds directed to the UNLV School of Medicine Dept. of Emergency Medicine Residency Program Fund. The fund provides support for the UNLV School of Medicine to train physicians as emergency medicine specialists at UMC, Nevada’s only Level 1 Trauma Center. UMC played a critical role in the initial response to the tragic shooting in Las Vegas and continues to be an important site for the treatment of victims, many who are facing a lifelong battle to recover. The National Association for Stock Car Auto Racing Inc. (NASCAR) established The NASCAR Foundation in January 2006 to support initiatives that positively affect the lives of children throughout the United States. The 501(c) (3) non-profit entity partners with medical experts and other charitable organizations to fund children’s health care programs. The NASCAR Foundation has cumulatively donated $30 million to reach more than one million children. For more information on The NASCAR Foundation, please visit: NASCARfoundation.org. Follow The NASCAR Foundation on Facebook at www.Facebook.com/NASCARFoundation or on Twitter: @NASCAR_FDN.